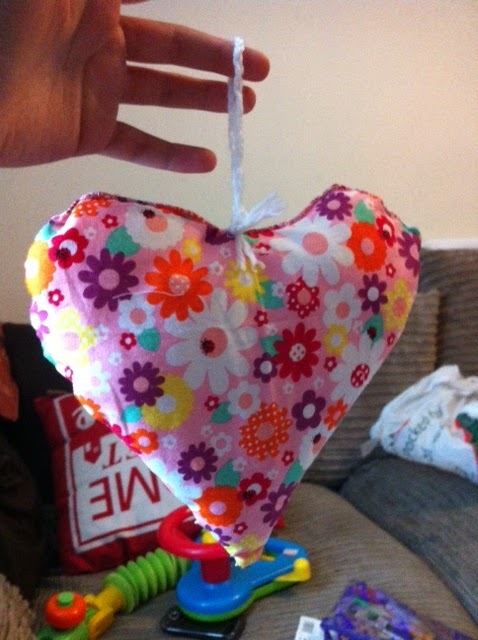 Now Louise has received her gifts, I am going to 'big myself' up a bit and post up all the gifts I made as part of the Homemade Heart Swap. 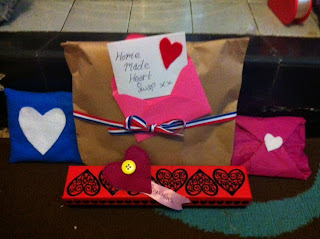 I enjoyed making my crafts, especially as I love hearts and making people smile. I love to give gifts but never been confident enough to make and actually hand over a homemade gift until now. Christmas here I come! Even my wedding is getting some of my new craftyness injected into it! I reused nice smelly coloured candles I had in my craft box, melted them down and poured them into a silicon heart mold. 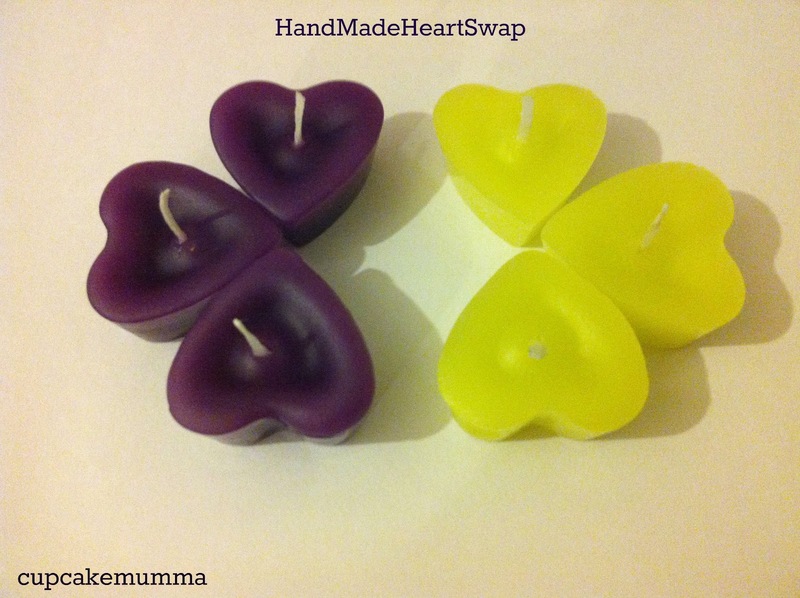 It took me a few attempts to make these perfect but finally they came out and I'm really pleased with them. 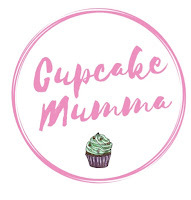 I used to make jewelry when I was living in the countryside to pass the time when Little Miss was at nursery for a few hours, especially when I became pregnant with Little Man and I couldn't go anywhere without chucking up! 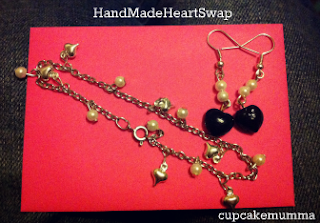 I dug out my old bits which there is a lot of still and made Louise this heart bracelet and earring set. I don't know if she has her ears pierced but it seemed fitting to make a set! Bird seed. I went through Louise's blog and noticed she liked nature a lot. 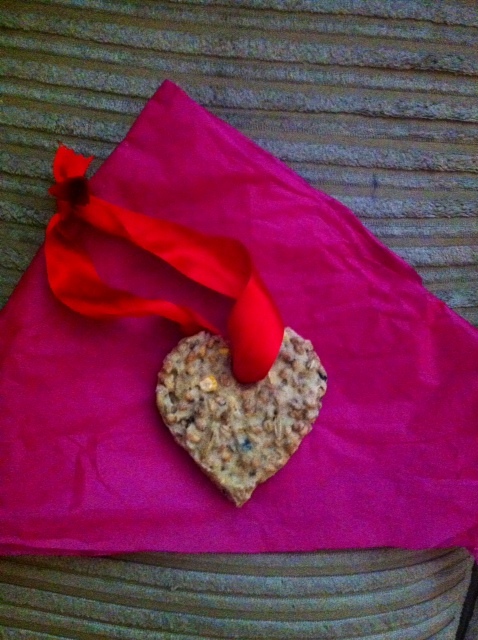 I just new she'd love something for outside so came up with this bird feed heart. I used foil to make a heart shape, mixed seed mix, flour and water and placed the mixture into the foil. I popped a straw in the top and baked in the oven for nearly an hour. When it was cooled, I removed the straw and when totally cold I put some ribbon through and wrapped it up for its journey! I made Louise a little book mark too. It looked a little bare so I thought adding this button would be a bit of a quirky little extra, I do like buttons! I'm going to make myself one soon I think, I've been reading these kindle books for too long and I'm missing turning real pages. Finally a small little cushion I made from some left over fabric I bought for £2 last time I visited Plymouth. I had no idea what to do with this fabric until the heart swap came along. I've never really sewed before so it's not perfect, but i certainly put a lot of effort (and love) into it! Hope you like my makes. They've already been put to good use by Louise which is just wonderful, as have mine! Thanks for reading.